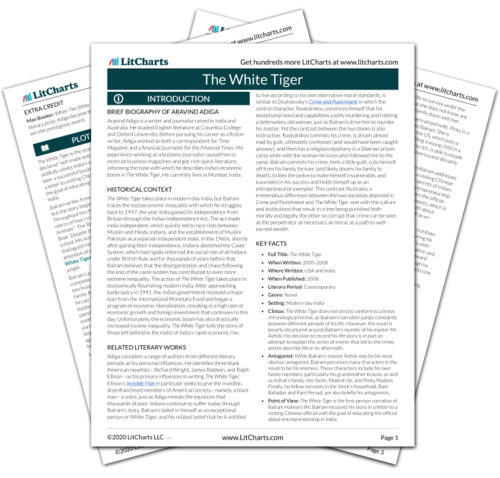 Instant downloads of all 942 LitChart PDFs (including The White Tiger). 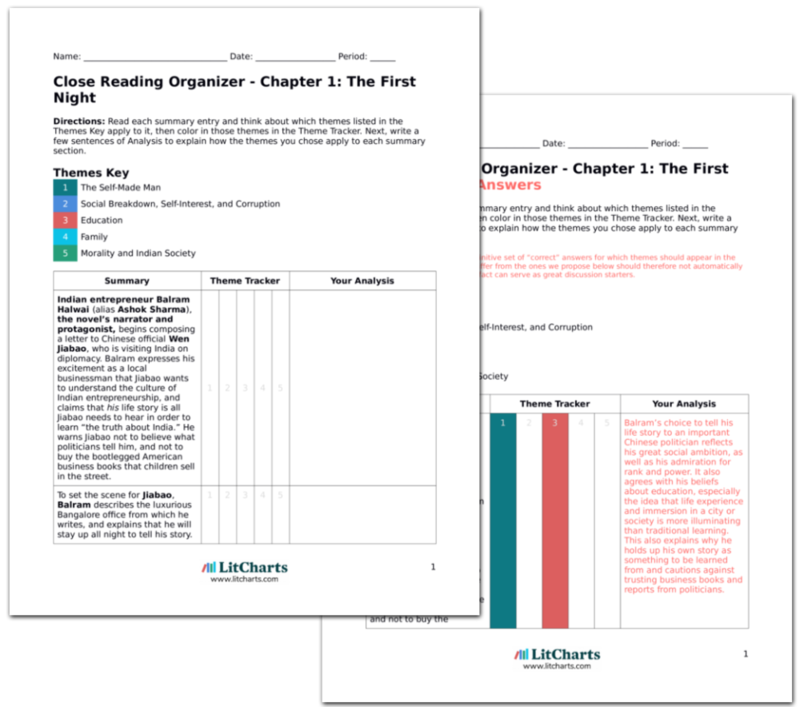 LitCharts assigns a color and icon to each theme in The White Tiger, which you can use to track the themes throughout the work. Throughout the novel, Balram describes family as a destructive and burdensome part of Indian life, one that prevents its members from pursuing individual advancement and liberty. Balram’s grandmother Kusum embodies this negative image of family in the story. She shortsightedly pulls both Balram and his brother Kishan out of school at a young age, and attempts to arrange both brothers’ marriages early in life, before they are able to support families of their own. The rich are similarly burdened by familial obligation and interference. Even Balram’s wealthy master Ashok complains of his father and brothers’ attempts to exert control over his personal life. Balram further believes that the traditional Indian family unit keeps the Rooster Coop of social inequality alive. If a servant attempts to escape or disobeys his employer, the superior’s family will punish the servant by murdering or brutally torturing his family. In this way, familial loyalty and love become weaknesses that can stop an individual from being able to advance. The arrival of Balram’s young cousin Dharam in Dehli fits into this pattern. Just when Balram has resolved to murder his master Ashok, Kusum sends Dharam to live and work with Balram. For better or for worse, this new responsibility of caring for his relative initially prevents him from executing his plan and taking a radical step to alter his future. Ultimately, though, Balram does carry out his plan to murder Ashok, knowingly sacrificing his own family to brutal and probably fatal vengeance in the process. He cuts loose his own family in order to free himself. That the family plays this negative role in Balram’s world is a reflection of the deeply corrupt and immoral state of Indian society, which transforms even the most sacred, intimate relationships between people into tools of oppression that someone like Balram feels he must escape in order to achieve freedom and success. The ThemeTracker below shows where, and to what degree, the theme of Family appears in each chapter of The White Tiger. Click or tap on any chapter to read its Summary & Analysis. 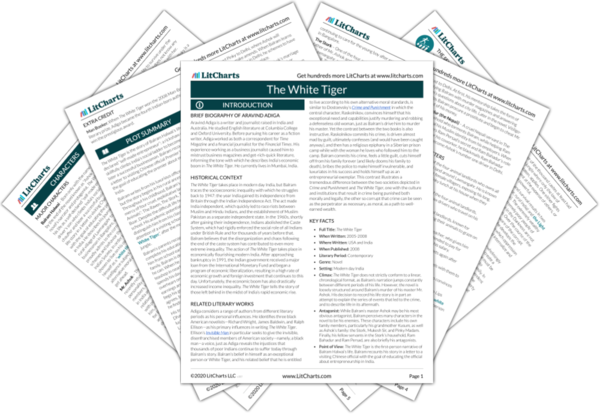 Get the entire The White Tiger LitChart as a printable PDF. Below you will find the important quotes in The White Tiger related to the theme of Family. Unlock explanations and citation info for this and every other The White Tiger quote. Scopa, Sally. "The White Tiger Themes: Family." LitCharts. LitCharts LLC, 17 Jun 2015. Web. 18 Apr 2019. Scopa, Sally. "The White Tiger Themes: Family." LitCharts LLC, June 17, 2015. Retrieved April 18, 2019. https://www.litcharts.com/lit/the-white-tiger/themes/family.